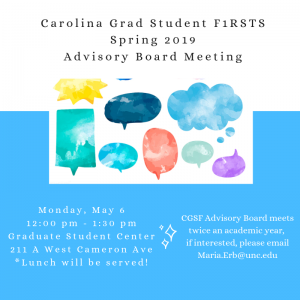 CGSF – Spring 2019 – Advisory Board Meeting Monday, May 6 12:00 pm – 1:30 pm Graduate Student Center 211 A West Cameron Avenue Join us for the Spring 2019 CGSF Advisory Board Meeting! The Advisory Board meets twice an academic year for about 1.5 hours. *Lunch will be served! 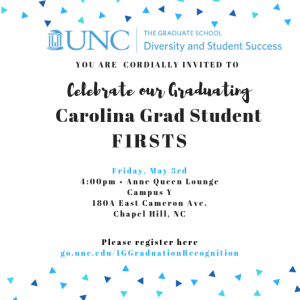 If interested in joining the Advisory Board, please email Maria.Erb@unc.edu to be added!